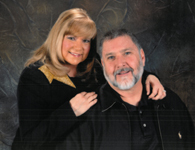 What is Son Grace Music Ministries? Son Grace Music Ministry (SGMM) is a full-time evangelistic ministry that travels 12 months out of the year both inside and out of the United States. Rev. John & Filese Hauser have been working both together and separately for many years bringing the ministry in word and song. The form that this ministry takes ranges from one evening services and concerts to month long, statewide revivals. We are determined to complete our commissioned journey and mission by arming ourselves in the power of the Holy Spirit and God's Holy Word, covered by the blood of Jesus Christ, in who's name we go forth. The vision will be accomplished through the ministry of Son Grace Music Ministry, in avenues of music, song and the spoken Word as they are proclaimed at every opportunity on an international scale, through revivals, retreats, campaigns, conventions, seminars, radio, television, teaching tapes, recordings, witness tracts, books, personal and ministry correspondence, and by the covenanted partners to Son Grace Ministry, Prayer Intercessors and Eternal Financial Investors who pledge their support on a daily, weekly, and monthly basis to this, God's Son Grace Music Ministry. This is multiplied by our obedience to the Word of God in the giving of financial support, through tithes, offerings and alms, to other ministries of like mission, vision and purpose. The most important goal of SGMM is to bring people into a relationship with Jesus Christ, or find their way back to Him. There would be no reason for the existence of this ministry without fulfilling the commission of the Lord Jesus Christ to “Go into all the world and preach the Gospel (the Good News of Jesus Christ) to all creation.” Mark 16:15. SGMM is financially supported by offerings, donations and album sales. Filese Hauser is the CEO/Founder of SGMM and Rev. John Hauser is the President of SGMM. During all of the years of ministry, SGMM has operated on faith in the Lord Jesus Christ to provide through your offerings, donations, and album sales. SGMM is a business/ministry that is operating totally on faith based principles which receives no regular/monthly income or pay from any church, denomination or organization. Promoting growth and enrichment to the Spirit, Soul and Body through ministry of Integrity in Song, Word and Biblical Counseling, while being mobile in outreach, projecting toward a multi-faceted stationary center where ministry flows both in and out. As we proclaim Jesus Christ as the only Savior for our lost souls and world, our vision is to teach the Word of God clearly and in simplicity, that all may come to the realization of their need for Jesus as Savior. Challenging them to go on in their journey of faith and discipleship to a fuller understanding of making Jesus Lord of every area of their life. Stressing the total dependency upon the anointing and transforming power of the Holy Spirit in order that they might activate and apply the Word of God as life to them in a very practical and effective manner. Our vision is to see the Body of Christ "Rise-Up" and become the people God has called us to be, living a sanctified, Spirit led life, set apart unto the Glory of God, operating in the power of the Holy Spirit in order that we might make a positive and eternal difference in these days of such negative, liberal and humanistic control. Reaching out to all the world in God's love, yet calling for repentance that will bring transformation and change in lifestyle, behavior and attitude, so that we might reflect the image of Jesus as we choose to go deeper in Him on a daily basis. Challenging all believers to accept the Revival of their commitment to Jesus Christ and the preparation of His imminent return for the Church. That we, the Church, the Bride of Christ, might enter into eternity with the Lord, hearing Christ say, "Well done, good and faithful servants." Taking the transforming power of Jesus Christ and His Gospel to a hurting world. Through the message we share in word and song, we trust that the loving touch of the Holy Spirit will draw the hearer to choose eternal life rather than death, love not hate, joy in place of sadness and sorrow, and a positive way of living by the Word of God, being delivered from the humanistic negativism of this present world through the Blood of Jesus Christ. In one true and living God, Creator of Heaven and Earth, Redeemer and Sustainer, ruling over all things. He is unchanging, infinite in power and eternal. He is revealed to us in three persons: Father, Son, and Holy Spirit. God the Father - reigning over all the Universe who is all powerful, all knowing, and ever present. God the Son - The Lord Jesus Christ, the eternal Son of God became man without ceasing to be God, being conceived by the Holy Spirit and Born of a Virgin, that He reveal God and redeem sinful man by giving Himself as the substitute sacrifice on the cross, after which He was resurrected from the grave and ascended to His Father , to be seated at the Father's right hand, where He intercedes on behalf of those choosing to believe and trust in Him. That Jesus Christ will one day physically, visibly and personally return again in power and glory to judge nations and receive those who believe in Him as Savior and Lord. The Church Universal, and the coming together of believers in order to receive encouragement and scriptural instruction for their daily journey of faith that they might be developed, trained and equipped to make disciples of all persons and reminding them that they are commissioned to occupy and remain busy in service for the Lord, until the day of Christ's return for His Church.